Ever since Rihanna launched Fenty Beauty, I've been so curious to try out her foundations, especially since a lot of reviews state that it is great for oily skin. However, I wasn't quite ready to dish out $34 on a bottle of foundation that may or may not get used. Then, I stumbled on Stephanie Nicole's Youtube video review on the lineup and she mentioned that she found a dupe by searching the ingredients and the closest one she found was the Catrice HD Liquid Coverage Foundation. I knew I had to get the Catrice version because it's available at the drugstore and I had a Fenty sample coming my way, so I just had to compare them for myself. By now, you should know very well what the claims of the Fenty Beauty Pro Filt'r Soft Matte Longwear Foundation are because it is literally everywhere. Basically, there are 40 shades in the lineup, 32ml or product and retails for $34 on the Fenty Beauty website and Sephoras worldwide. Packaging: Frosted glass tube with a pump. Easy to control amount dispensed. Texture: Runny liquid. Spreads easily but dries quickly. Vegan. Cruelty free. Made in Italy. This is a lesser known brand but it is quite well known in Europe because it originates from there. A lot of people love this brand and the foundations too but most of the reviews are in a foreign language. This retails for $10.99 on Ulta but I got it for SGD12.50 in Guardian Singapore for 30ml of product. There are only 4 shades though, and they are meant only for light-fair skin. 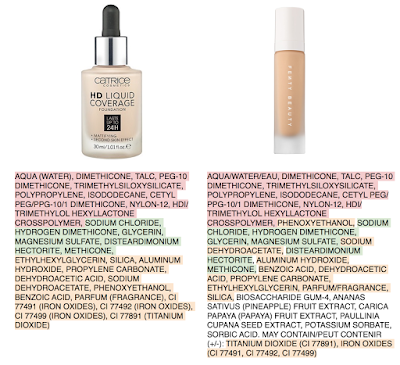 There are lightening and darkening drops available separately for you to mix with the foundation to get a better match but it seems really troublesome to me. Packaging: Frosted glass bottle with a dropper. Easy to control amount dispensed. Texture: Slightly thicker than Fenty but still on the liquidy side. IMO this should be in a pump bottle too. Application: Best applied with a sponge. 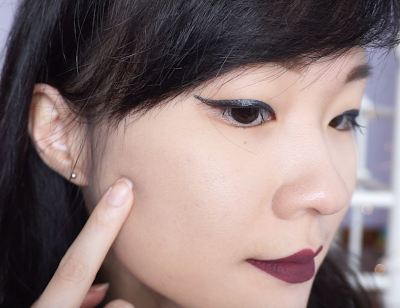 Prior to my half and half face test, I tested the foundations out individually on my entire face for a few days so that I can get a good idea of how they truly perform on my skin. I have Normal-Oily and sometimes combination skin with my T-zone getting the most oily. I have some dry areas sometimes due to hormonal changes but mostly just oily and normal skin. My skin tone is about NC 20 in MAC and 2N1 Desert Beige in Estee Lauder Double Wear. For this review, I used the shade 030 Sand Beige for the Catrice foundation, which is a perfect match for me, and 210 in Fenty, which is a pinch darker than my skin tone. I can still pull it off though. I think I am more of a 140-150 in Fenty. This is how my face looks without anything on my skin. You can clearly see my pores here and some spots and redness but I don't have acne problems or pimples at the moment. This is how the Catrice foundation looks freshly applied. It didn't cover my hyper-pigmentation but that's fine because I find it really hard to cover it even with concealer. Below it are some scratches so ignore that too. Overall, my skin looks more evened out and you can still see some pores on my nose and cheeks but some of them have been covered. Everything looks very natural and not foundation-looking in any way. This is with one layer and I think it provided me with medium-ish coverage. I do foresee cakiness with another layer. This is the Fenty side. It looks slightly warmer and darker, but we're not here to compare colors. This is with one layer so some of my spots are still peeking through but it isn't obvious at all. The Fenty foundation has better pore coverage so my skin looks smoother but it feels slightly sticky. It also clings onto dry areas and dry skin like on my nose so that doesn't look pretty. Definitely should have exfoliated beforehand. Otherwise, this is also a buildable medium-full coverage foundation that evened out my skin and blurred my pores. 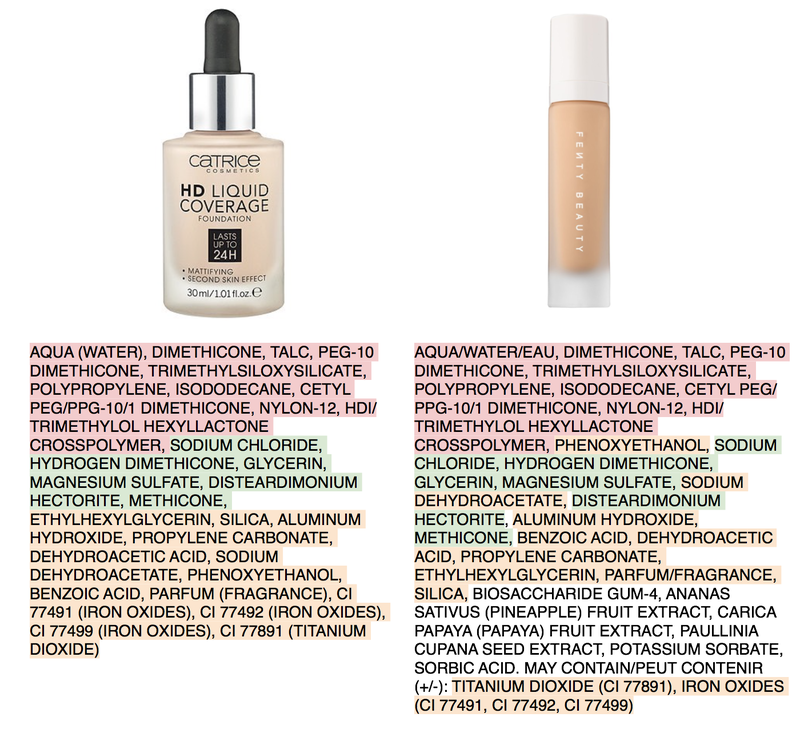 On the separate occasions that I wore these foundations, I did notice that the Catrice foundation had better oil control. 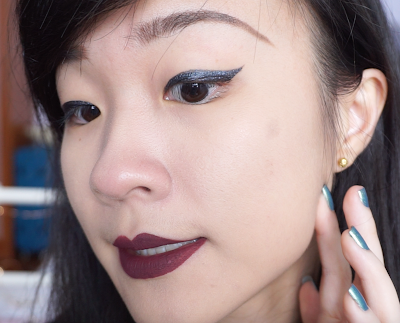 I felt less greasy when using the Catrice foundation. The Fenty foundation remained sticky throughout my wear time and because my face gets oily, the stickiness combined with oil just isn't a great feeling. Both foundations transfer lightly when blotting but I think Fenty transferred a little bit more because it makes me slightly more oily. At the end of the day, both foundations were still very much on my face. I haven't broken out or faced clog pores when using these. 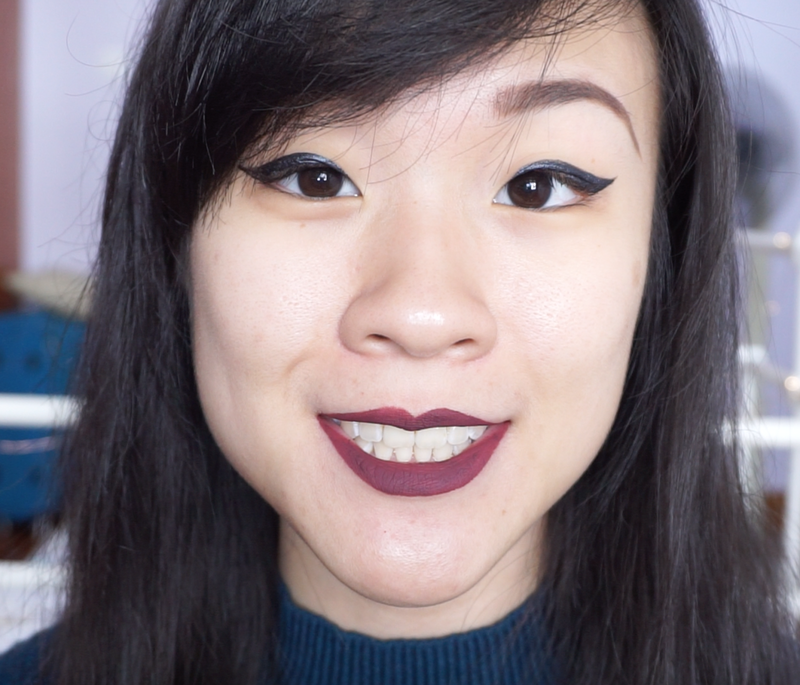 I really like the Catrice foundation and I think it works great with my skin. I like the oil control with it. If you want flawless skin with a natural look, this is the foundation to go with. Would I get a full size of the Fenty Beauty foundation? Perhaps not. It does have the same oil control and I do enjoy the pore coverage that the Fenty foundation provided but I do not like the stickiness that comes with it. I know powder might help but one step less in makeup is always good because it isn't good to pile so many things on your skin. Plus, powder can make it look cakey and clog pores.